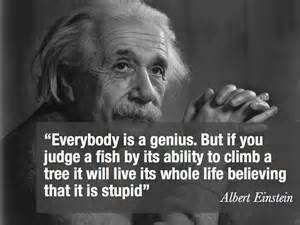 Einstein Quote . . .
How often we judge people by our own expectation. If someone doesn’t think like us, look like us, believe like us we first draw on the way we were raised and have instant assumptions of intelligence and worthiness. Hopefully as we age and gain wisdom we learn to see the beauty in all people. But I see so much anger and hate. I almost regretfully look at the news happening today because of the negative things people do to each other – in the name of religion, in the name of God, and in the name of their political party. It saddens me to see so much unnecessary unhappiness. People come together on social media sites and bash each other because they only see the differences and failing to see the things that should bring them together. We should all come together and fight against the machine that seems determined to drain away any goodness we have left. If we don’t, everyone will look around at each other and ask? Who is at fault? It wasn’t my fault. It wasn’t my responsibility. it was someone else fault. But we will all have to live with it. Why didn’t we stop this before it was too late. When we make these negative causes we will also have to learn how to live with the negative effects, the consequences of allowing it to happen. Previous Ever Bite Off More Than You Can Chew?